New technology allows researchers to discover tunnel dug by prisoners in an attempt to escape the Nazis. In the Ponary woods, near Vilna, scientists have made an emotional and exciting discovery. Using x-ray technology a team of researchers has found a tunnel dug by concentration camp prisoners to escape the Nazis. For decades this tunnel remained hidden, but advances in technology have revealed its exact location. During the holocaust, over 100,000 residents of Vilna, including 70,000 Jews were murdered at Ponar (officially known today as Paneriai) by the Nazis and their corpses thrown into pits. In 1943, as the German forces withdrew from the eastern front, a special unit was established tasked with hiding any traces of this massacre. 80 inmates from the nearby Stutthof concentration camp were formed into Leichenkommando ("corpse units"). During the day, while chained to one another, they were forced to dig up the corpses and burn them. At night they were kept in a giant pit. These inmates realized that as soon as their awful task was completed they would also be murdered. To escape from the Nazis they dug a 35-meter tunnel leading from their pit to the other side of the fence. The tunnel was painstakingly dug by hand over the course of 3 months. On the last night of Passover, April 15, 1944, they made their escape. Using a file they removed the chains from their legs and 40 of them escaped through the tunnel. However, their escape was soon discovered by the guards. Only 15 prisoners managed to escape and only 11 of them managed to reach the partisans and survive the war. The remainder were caught and shot. The Ponary massacre and the escape of the prisoners are ingrained in the collective Israeli psyche through the song with lyrics by the Warsaw Ghetto composer Szmerke Kaczerginski, sung by Chava Alberstein. Despite many attempts to discover it, the location of this escape tunnel has been hidden since the end of World War II. Now, a team led by Dr. Jon Seligman of the Israel Antiquities Authority and Prof. Richard Freund a Judaic studies professor at the University of Hartford with support from the Vilna Gaon Jewish State Museum, EDVision Corporation and the PBS science series NOVA has discovered the tunnel. Using ground penetrating radar (GPR) and electrical resistivity tomography (ERT) they have found the tunnel leading from the pit where the prisoners were held. According to Dr. Seligman, "As an Israel whose parents came from Lithuania, the moment when we discovered the tunnel was so emotional it brought me to tears. This touching evidence shows the triumph of hope over despair. Discovering the tunnel makes it possible for us to show not only the horrors of the holocaust but also the hope for life." Culture and Sport Minister Miri Regev said, "I bless the Antiquities Authority for this unique international partnership, which allows us to turn rumor into fact. The exciting discovery of the prisoners' tunnel is another proof against the holocaust deniers. The technological advances which make it possible for the Jewish people to uncover more and more stories of heroism that the Nazis tried to cover up are a great achievement and of benefit to all humanity." 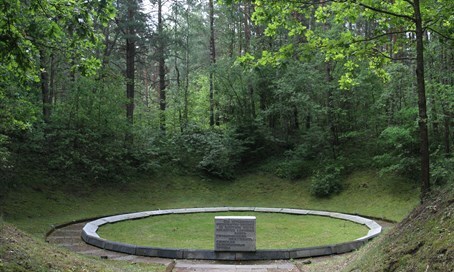 The partnership intends to return to the site in the future to unearth the tunnel so that it can be presented to the public as part of the Paneriai Memorial Museum commemorating the murder of the Jews of Vilna. A NOVA documentary on the discovery will air in 2017 on PBS.